Jackson Heights is a bustling neighborhood, famous for its garden apartment buildings and its diversity. More than half of its residents are immigrants, particularly Colombians, other Latinos, and South Asians, with its own Little India. Jackson Heights flourished in the 1920s with unique garden co-ops that attracted middle-class professionals escaping overcrowded and overpriced Manhattan. Today, for similar reasons, Jackson Heights has again become a hot neighborhood and real estate market. Jackson Heights' northern boundary is the Grand Central Parkway. East Elmhurst is northeast (86th St) and Corona East (Junction Blvd). Elmhurst is south of Roosevelt Avenue. To the west is Woodside, across the BQE. Jackson Heights' main drags are Roosevelt Avenue (under the elevated subway), Northern Boulevard, 37th Avenue, and 81st and 82nd Streets. The Historic District is between Northern Boulevard and Roosevelt. Little India's center is at 74th Street and 35th Avenue. Jackson Heights is a 20-minute commute on the 7 subway to Midtown Manhattan from the 82nd Street station. Or else take the E, F, G, R, or V trains from Roosevelt Avenue. E and F are express through Queens. Buses 19, 19B, 33, 47, and 66 serve Jackson Heights. In theory, Jackson Heights is easy to reach from the BQE, but in reality, exiting onto Roosevelt is a nightmare. Parking and congestion seem worse every year. LaGuardia Airport is close via the Grand Central. Buildings with four to eight floors dominate the heart of Jackson Heights. One-family and two-family homes are not uncommon. North of Northern there are more row houses, smaller co-ops, and cheaper prices. Prices have risen fast. Indian curries at the Jackson Diner (37-47 74th St) continue to satisfy. Arunee Thai (37-68 79th St) hits the jackpot with spicy/sweet Thai. Pio Pio's (84-13 Northern Blvd) Peruvian-style roasted chicken is delicious, and the big, colorful restaurant is the total scene of families and friends. The cheapest delights are from street vendors on Roosevelt Avenue. On a Friday night sample tacos, arepas, fresh fruit slices, and roasted corn. Jackson Heights was farmland when the Queensboro Bridge opened in 1908 connecting Manhattan to Queens and prompting entrepreneur Edward A. MacDougall to buy as many farms as possible along the planned subway route. His Queensboro Corporation developed Jackson Heights, creating unique and popular garden co-ops and private homes, which were inspired by Britain's Garden City movement. After World War II new developments were more densely populated, and an original golf course was paved over. In 1993, the City named the original Jackson Heights garden co-op area an historic district. Landmarking was a result of the Jackson Heights Beautification Group (JHBG)'s campaign to revitalize the neighborhood. It has helped inspire pride in the original details of the co-ops and English Garden homes. But for some owners, landmark requirements delay repairs. For a great local history, read Jackson Heights, A Garden in the City by Daniel Karatzas. Or attend the JHBG tours of the district. The only public park in Jackson Heights is crowded, black-top Travers Park (34th Ave between 77th and 78th Sts), also the site of summer Sunday concerts and the farmers market. Many of the prewar co-ops boast shared, private gardens, each about a city block in length. The gardens are open to the public once a year for an event run by the JHBG. Local children and politicians march in the annual Halloween Parade. The Queens Lesbian and Gay Pride Committee's Pride parade starts in the neighborhood. Jackson Heights is a safe neighborhood, though it always pays to be more careful under the subway on Roosevelt Avenue or on busy Northern Boulevard. Drug trafficking is no longer the major problem it was in the 1980s. 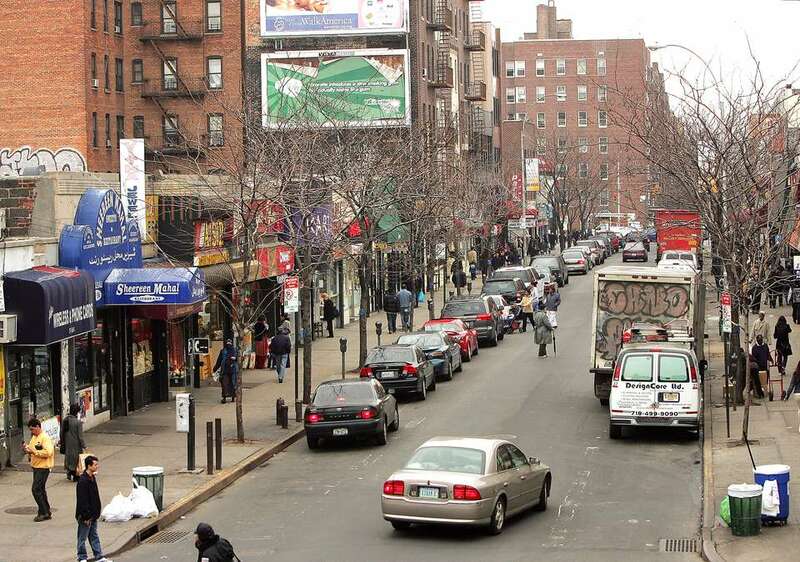 Jackson Heights Problems: Traffic plagues Roosevelt Avenue. Parking is a headache everywhere. Famous Residents: Actress Lucy Liu, photographer Alfred Eisenstaedt, and musicians Benny Goodman, Glenn Miller, and Woody Herman called Jackson Heights home. Gay Bars and Clubs: Jackson Heights is the center of the gay Latinos in Queens. Most Famous Street Sign: The 35th Avenue sign has Scrabble scoring in honor of Alfred Butts, who invented the game in Jackson Heights. Shopping: Walk east on Roosevelt for leather cowboy boots, Mexican music stores, and botanicals. Little India sparkles with 22k gold jewelry, not to mention Bollywood DVDs. Parking: Take the subway and be happier. Or try 35th Avenue. North of Northern, parking is a little easier. Movies: Catch Bollywood flicks at the Eagle Theater (73-7 37th Road) or mainstream Hollywood at the Queens Circuit Jackson Triplex (40-31 82nd St). Banking: Find local and national banks on 74th and 81st Streets.